Background: Ectopic pregnancy is a pregnancy with the zygot implanted out side the endometrium of the uterine cavity. 95% of ectopics are in the tube, 1.5% abdominal, 0.5% ovarian and 0.03% are in the cervix. EP can be diagnosed by serial quantitive beta subunite of human chorionic gonadotrophin hormone and transvaginal ultrasound. Methotrexate injtion give high success rates (86 to 94%) that are not skill-dependent and has become a standard medical treatment in appropriate patients. The best suitable cases for MTX therapy for undisturbed ectopic pregnancy are those who are not suffering symptoms, have a blood level of Q B-hCG of less than 5000 mIU/ml, tubal size less than 3.5 cm, no fetal cardiac activity on US, and will come in to be followed closely. MTX is typically given by injection and this method increases absorption of all of the medicine. Common side effects of MTX treatment for undisturbed EP include: abdominal pain, vaginal bleeding, nausea and vomiting and dizziness. Women diagnosed with an EP were considered candidates for treatment with MTX injection if they were hemodynamically stable, did not have free fluid outside the pelvic cavity on US examination, did not desire surgery and agreed to weekly follow-up visits until the level of serum Q B- hCG was fifty mIU per ml or lower. Aim of the work: To evaluate the fate of undisturbed tubal EP after injection of MTX. 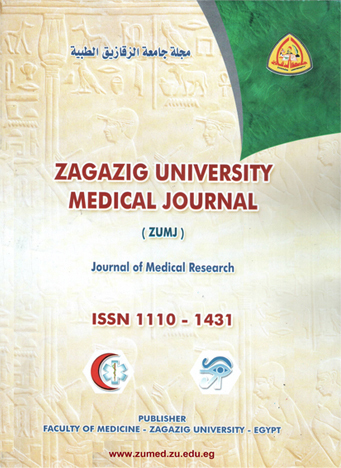 Patients and methods: This prospective study was carried out at the Department of Obstetrics and Gynecology, Zagazig University Hospitals on 54 women with undisturbed EP. The women were informed regarding the treatment and were consented. We gave single dose of MTX (50 mg/m2 of body surface area) to the patients. Q B-hCG were followed on day one (injection day), day four and on day seven. We administered 2nd dose of MTX if the level of quantitive of beta subunite on seventh day had not decreased by at least twenty five percent from the first day level and the protocol was repeated. If decrease in quantitive beta subunite between days four and seven was less than fifty percent, asecond dose of MTX (50 mg/m2) was given. Weekly measurements were continued until the quantitive beta subunite is undetectable. If quantitive beta subunite falls < fifty percent between weekly measurements after third dose, we perform laparoscopic salpingostomy or salpingectomy. Results: In current study the level of Q B-hCG in the studied cases pre-injection ranged from 397 to 7102 mIU/ml, its mean was 4231.9 ± 2210.3.4th day level ranged from 107 to 7400 and its mean was 3881.7 ±2317.6 mIU/ml. 7th day level ranged from 30 to 7900 mIU/ml and its mean was 2566.9 ±2145.6 mIU/ml.The success rate in the current study was 83.3% classified as follow:44 patients (81.48%) recived single dose of MTX. 10 patients (18.52%) recived multiple doses one week a part ( need prolonged follow up that exceeded 30 days). 6 patients (11.1%) had laparoscopic management and 3 patients (5.6%) had urgent laparotomy. Conclusion: There is no pathognomonic pain or findings on examination that are diagnostic for tubal pregnancy.Also the diagnosis of tubal pregnancy ,as early as 6-7 weeks postmenstrual by screening of all suspected pregnancies may be the key for optimal use of medical treatment. Transvaginal ultrasound and serial quantitive beta subunite are highly successful in early detection of EP.Medical management by methotrexate injection is safe and cost effective for the reolution of ectopic pregnancy proplem.